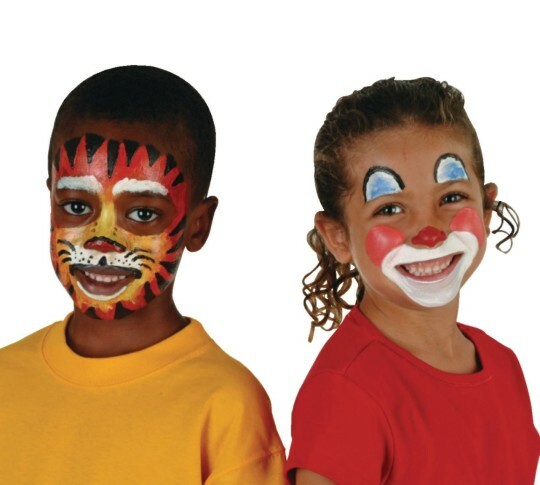 We've made face painting easier than ever! Big kit lets you paint over 100 faces! Simple cheek painting to full-face treatments! Fun at birthday parties, carnivals and holidays. This Face Painting kit includes everything you need for professional-looking results! With this kit you can paint over 100 faces, depending on the amount of design on each face. Includes six 8-oz. 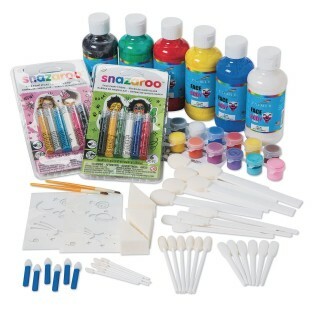 bottles of face paint in assorted colors, 2 stencils, 2 brushes, 2 face paint strips with 6 assorted colors each (1/4 oz. per cup), 3 sponges, 36 assorted foam applicators and 12 face paint sticks. Made in the USA. This product was used to paint faces during our Carnival. I comes with everything you need. In fact it came with so much paint we had enough for next year's Carnival. The only thing it didn't come with was glitter paint. We purchased the glitter paint from SS seperately Tulip Body Art Kit for very little money. The Face Painting Booth was a big hit at the Carnival. Thanks. I was employed to run a holiday event at a prestigious hotel for an upscale event which was catered towards children of all ages. all children LOVED this product receiving tattoos or face painting. There is nothing negative to say about this product except for the lack of paint containers to use the larger paint in the bottle however the tattoo pens sufficed the entire night The fact there were two packages of tattoo pens helped greatly. The smaller tubs of paint helped with adding color variety. I thank you for this product I wouldn't have been able to carry out this face painting station without it.